Conor McGregor has claimed he "won the battle" despite being defeated by Khabib Nurmagomedov - as the fallout from the controversial fight night continues. A mass brawl broke out in the T-Mobile Arena in Las Vegas moments after McGregor was forced to tap out in the fourth round of the fight. Khabib jumped out of the octagon in an attempt to confront Dillon Danis, a member of McGregor's camp. Meanwhile, the Dublin fighter could also be seen striking a member of Khabib's team on top of the octagon. 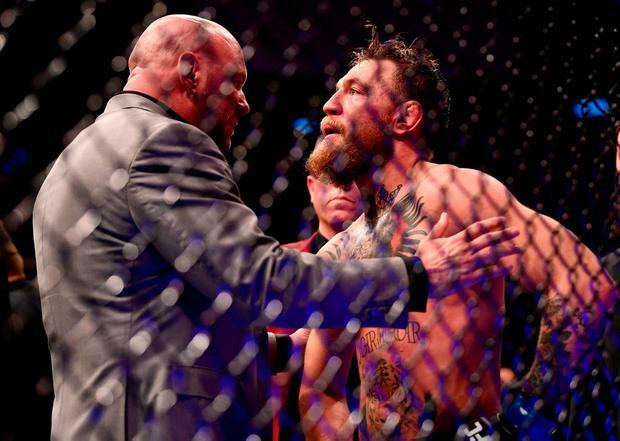 Soon after, a number of people invaded the octagon, and McGregor was hit on the back of the head a number of times. UFC boss Dana White said that three men were arrested for the attack on McGregor but the Irish fighter declined to press charges. Yesterday, McGregor tweeted a photo of himself sporting a black eye, and said: "We lost the match but won the battle. The war goes on." In the hours following the fight, McGregor also said he was "looking forward to the rematch". Yesterday, Khabib also tweeted about the fight, appearing to suggest that McGregor was "slowing down". On Sunday, White said Khabib's payment for the fight had been withheld pending an investigation by the Nevada State Athletic Commission, but McGregor was paid.